A wonderfully mystic and dark bread pudding, that is not actually made with plums (or prunes) at all. This has been explained by the claim that the dried plums imported by Elizabethans were held in such esteem that the word plum came to be used in reference to other dried fruits (especially raisins and currants). Other fruits, such as apples, fruit peel, cherries, etc. may all be included in the recipe including almonds. 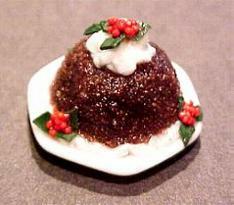 Plum puddings today are usually put in a basin or mold and set in a pot of boiling water. Traditionally, they are often made a year in advance. The pudding is then turned out onto a plate, and may be accompanied by Cumberland rum butter or brandy butter. Small paper-wrapped coins are sometimes pressed into the pudding as good-luck pieces just before it is served. Knead a piece of Terra Cotta Fimo, roll into a ball and press (loosely) into aluminum bowl or other similar mold, being careful not to over-extend onto the rim of the mold. Bake Fimo in mold at 300 degrees for 10 minutes. Let cool, snap molding out of mold with tip of X-acto knife. Place molding on a piece of sticky-side-up masking tape. Using disposabe paint brush, thickly coat with Brown Gallery Glass Stain. Sprinkle on brown terrarium sand and brush with Glass Stain again, until the desired look is attained. Let dry thoroughly. Glue onto platter. To decorate (optional) - Roll a very thin snake of white sculpey. With a toothpick and 527 Multi-purpose Cement, draw a thin line of cement around the base of pudding. Attach the white snake, and cut to fit. With the very tip of an X-acto Knife, texture the cream. For holly decorations, roll green Fimo thinly out on flat surface and with X-acto knife, cut out leaves. With red Fimo, roll tiny beries. Glue all, as desired, to pudding. Bake finished pudding at 275 degrees for 10 minutes. When cool, paint with thin coat of Fimo matte lacquer.